The area around present day Lockwood Drive used to be marsh, mudflats, and water. West Point Rice Mill can be seen in the center; Colonial Lake is on the far left. C. Drie. Bird's Eye View of Charleston, SC. 1872. American Memory LOC . It's general knowledge that a lot of Charleston's peninsula was built on filled land--and it's not hard to tell where creeks used to flow when we have a good rain at full tide. It wasn't that long ago, but if you weren't around it's hard to imagine the west side of town--from Tradd Street all the way up to the Citadel--was pretty much completely under water. The Ashley River hosted a couple of rice and lumber mills, some wharves, and some pretty nice water-front homes on Gadsden Street. There was no Lockwood, no Halsey, not much of Barre Street to speak of. But after the tidal mill ponds were retired, there came a Municipal Yacht Basin, a seaplane launch site, and a large naval presence--each of which seems a little crazy now. International seaplanes and Navy minecraft? Let's take a look! After the Civil War, production of rice fell to the point where Charleston's three major rice mills combined forces. 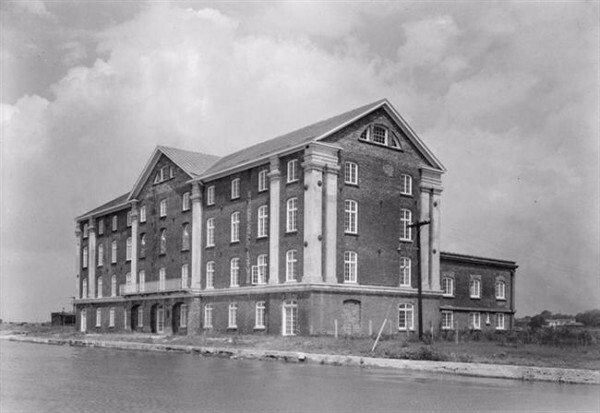 The West Point Rice Mill (built 1861-1863) operated sporadically throughout the Civil War and after the turn of the century, but the company was forced to sell off its machinery and maintain the property by renting wharf and warehouse space. 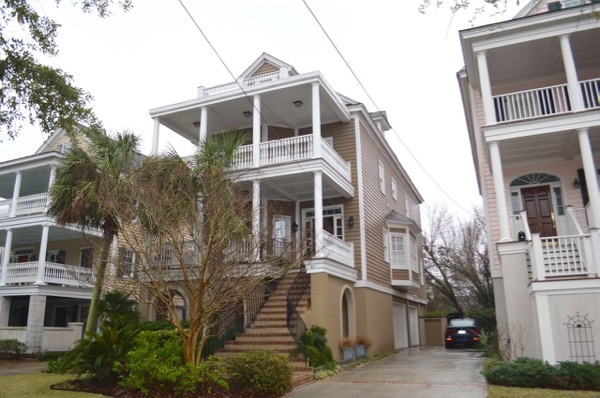 In 1926, the 43 acre mill property was sold to the City of Charleston; Mayor Thomas P. Stoney had grand plans to fill the mud flats and extend the 15 year old Murray Boulevard from Tradd Street all the way up to Spring. Those plans were relinquished and in 1930 the US Post Office came up with a better idea: the property was perfect to use as a seaplane base. Right? Apparently not, at least for mail. But James F. Byrnes (builder of Byrnes Downs) thought that Charleston would actually be the best gateway for transatlantic seaplane flights between the US and Germany. Pan American Airways agreed and in 1937, construction of the "James F. Byrnes Trans-Atlantic Seaplane Base" commenced. Wait a minute...people got to Europe on seaplanes? We thought it sounded strange, too. But seaplanes were a preferred way to traverse the Atlantic through the 1930s and Charleston was being forward-thinking. West Point Rice Mill, 1940. This is the only one of three antebellum rice mills on the peninsula that remains intact. Photo courtesy of HABS, LOC. A new road was built to connect the old mill to Calhoun Street and architects were brought in from New York City to plan the refitting of the mill. The first two floors of the West Point Rice Mill building were renovated for use as the Charleston Passenger Station. By 1939, however, it became clear that travelling to war-torn Europe via seaplanes was not viable, so the project was abandoned. After housing the Civilian Conservation Corps for a year, the property was taken over by the United States Navy. In the meantime, across this small spit of high ground, the New Deal's Civil Works Administration had taken one of the lumber mills' partially impounded tidal pools and turned it into a Municipal Yacht Basin. During 1934 the mill pond was dug out by hand, making it larger and deeper, and it was formally opened to the public in March,1935. Within a couple of years, significant improvements were made as it was developed to be part of the seaplane base. Piles were driven to shore up the enlarged basin as it was dredged to add fill to the land closer to the mill, effectively killing two birds with one stone. The US Coast Guard took over use of the basin during World War II, after which it became a popular marina for local boaters. Complaints by some visitors were lodged, however, as the yacht basin had few amenities compared to others on the east coast, and several rounds of improvements were made over the years. 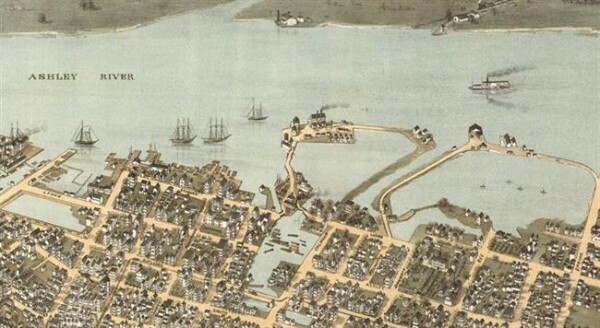 The Municipal Yacht Basin (center) is now Alberta Long Lake. The West Point Mill housed the US Atlantic Fleet Mine Force during the 1950s. 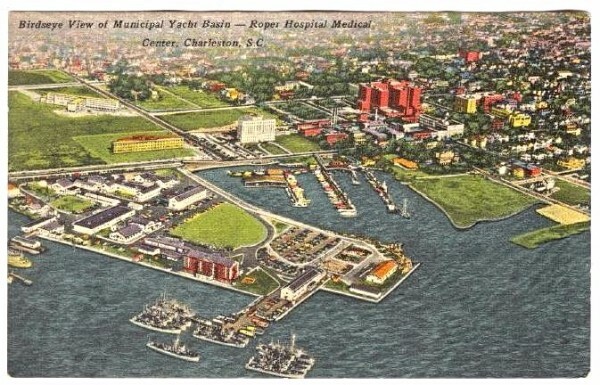 Roper Hospital can be seen across Calhoun Street from the yacht basin, flanked by the Tuberculosis Sanitarium on the left and the medical school complex (large red group of buildings) on the right. Postcard from the 1950s retrieved at delcamp.net. In the late 1950s, hotly contested plans were made to build another street west of Barre next to the yacht basin. Local yachtsmen complained that the new street threatened the success of the yacht basin: "The yachtsmen hold that the use of trash in reclaiming the land for the street has already created one vexing problem and more than likely will create ones in the near future. Right now, these men say, the problem is that of the ever-increasing population of seagulls, who, lured by the prospects of free meals, abound in the yacht basin area...'We have to wash down our decks five and six times a day at times,' one yachtsman contended." (N&C 1.05.58) You see, some of the land for the street's right of way had been settled for some years, but part of it had originally only been filled with sawdust, no doubt from the lumber mill. So, garbage was dumped on top and sprinkled with a little dirt, garbage, dirt, garbage, dirt...you get the picture. Alderman Alfred O. Halsey persisted with the plans, saying, "I just don't understand why these people get all worked up. There's just a very small amount of sanitary fill in there." It may have been a small area to start, but in the end not only was Halsey Boulevard built on landfill, but the areas south and west of there were, too. Can you imagine a whole section of the city hosting hundreds and hundreds of seagulls? 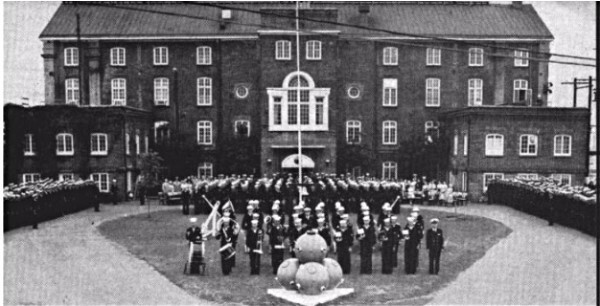 Top: "Minemen stand special formation in front of headquarters building of US Atlantic Fleet Mine Force during mass reenlistment ceremonies. Charleston, SC" From All Hands (Feb, 1957): The Bureau of Naval Personnel Information Bulletin. Bottom: "USN Minecraft Base, Charleston, SC. View of Pier Baker from the Ashley River showing crowded mooring conditions at pier." The West Point Mill building can be seen behind the ships and Pier Able is just to the north, slightly upriver. Photo undated, courtesy of NavSource.org Naval History. The Minecraft Fleet was stationed at the West Point Mill property until 1957, and after two years without Naval activity the property reverted back to the City. By this time, the Municipal Yacht Basin was barely navigable with accumulated silt and plans were made to move operations over to the old minecraft base. In the early 1960s, the whole area had a facelift. Access to the yacht basin from the Ashley River was closed off and filled in; much diminished, the old basin is now called the Alberta Long Lake. Lockwood Drive was extended over the filled land down to Broad Street and the City had a fancy new marina. Next time you're over there, think of all the changes that that area's been through. Pretty amazing, right? In 1941, the Charleston Area Inshore Control of the Navy moved in to the West Point Rice Mill and by the following year the third and fourth stories had been refitted to house radio rooms and administrative operations. Because of the infill from the yacht basin, there was considerably more land here now than had originally been associated with the mill. The Navy built docks, warehouses, barracks, mess halls, and recreation areas. In 1946, the site became the headquarters for the US Atlantic Fleet Mine Force, known for its 'wooden ships and iron men' (craft in the mine fleet were all made of wood and non-magnetic metal to prevent interference with mines). The entire Fleet was housed here in Charleston, including the 6-man 57-foot MSBs (minesweeping boats) that were known as the 'mighty mites of the splinter fleet', the MSCs (coastal) and MSOs (ocean-going). Did y'all know we had such a huge Naval presence downtown? Why didn't you say something? Lois represented the buyers in the sale of 89 Montagu Street last week. The area at the end of Wentworth and Montagu Streets at Lockwood was slated in 1981 to become "Presidential Row", including eight historic frame houses and four three-unit condo buildings. Seven homes from President Street and one from Spring Street were to be moved from the section of President in the area of Bee and Doughty Streets, lots that the Medical University had bought for expansion. The four oldest homes were moved to the new end of Wentworth (212-218), but we're not sure what happened to the others. Anyone know? Lois just represented the buyers of one of the lovely newer homes at the end of Montagu Street. Congratulations to the fortunate new homeowners! We understand the buyers are from Chicago, which was also built on garbage after it burned down...hopefully, y'all will feel right at home!